I have recently been trying to deconstruct and analyze the notion of global citizenship, mostly as a tangential interest into some other research, but also in light on this omni-present commodification of education and attacks from neoliberal camps. 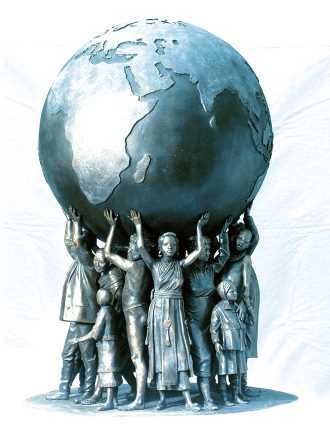 Global citizenship can be conceptualized as our capacity to imagine and mitigate the plight of others (including people, other species, and ecosystems) based on our capacity for critical examination, our ability to acquire and generate significant knowledge about the world, and our willingness to engage in imaginative compassion which surpasses all boundaries of race, ethnicity, gender, nationality, and class. Here is the text we will be using for the Experimental Lakes Area student experience. Brilliant book! Gift Ecology – Reimagining a Sustainable World :: Rocky Mountain Books. This summer, students from SJR will be traveling out to the Experimental Lakes Area in Northwestern Ontario to take part in a unique learning experience. This learning experience is inte nded to introduce young learners in Manitoba to the notions of ecological literacy and systems thinking through a direct experience with nature. By using the experience of the learners, educative experiences will be fostered in order for participants to gain an understanding of how they are connected with systems and species on earth and how human activity can negatively affect ecosystems and ultimately the biosphere itself. The first three criteria, those of democratic, growth, a change in direction, an interaction between inner and outer conditions refer to Dewey’s understanding of experience. Firstly, is the experience we create for students democratic? Are there opportunities for the learner to participation in the creation of his or her own learning experience? Secondly, does growth occur? Is there a shift in the attitudes and behaviour of the learner and have they changed direction in terms of their previous understanding of the world? Lastly, is there a connection between the internal experience of the learner and the experiences fostered by the educator? The subsequent three criteria are a reflection of how Freire characterizes experience. To avoid the Banking System of education, or a top-down approach where knowledge is banked into the hard drives of the learner, Freire suggest that there needs to be a dialogue between the educator and the leaner and within the learning community itself. Secondly, Freire insists on the notion of praxis –the application of the creation of new knowledge for the purpose of liberation. Lastly, the learner needs to be able to reflect on this new knowledge and his or her place within the world. The last five criteria are taken from the Centre for Ecological Literacy as outline in Goleman, Bennet, & Barlow’s Ecoliterate (2012). In it, the authors outline the Five Practices of Emotionally and Socially Engaged Ecoliteracy. Ecologically literate learning communities will be able empathetic towards all species and systems, will accept sustainability as a common practice, will make the invisible visible, will anticipate the consequences of human actions, and will understand how nature sustains all life. Based on these 12 criteria, the following experience has been created to create ecologically literate citizens. For this learning experience, the site of the Experimental Lakes Area in Northwestern Ontario has been selected. Students will spend two weeks, from August 3rd to 15th, on site, working with scientist on freshwater ecology experiments. Students will also be able to conduct their own experiments. Through this scientific process, students will be able to gain scientific skills as well as the ability to see how they are connected to all systems on earth and develop policy based on this new literacy. ELA was created in 1968 to study the problem of eutrophication or excessive algal growth in lakes. Despite improved understanding of the causes of eutrophication, this continues to be one of the greatest water quality problems world-wide. For 44 years, researchers at ELA have continuously added phosphorus to a small lake (Lake 227) in conjunction with different amounts of nitrogen. In recent years, this research demonstrated that efforts to control blue-green algae should focus on the control of phosphorus and that treatment for nitrogen is unnecessary. Other studies on Lake 227 have examined the potential effectiveness of fish introductions for remediating eutrophication, and interactions between eutrophication and atmospherically deposited contaminants such as PCBs and mercury. Lake 227 is among the most intensively studied lakes in the world. Continued eutrophication and monitoring of Lake 227 will continue to yield important insights into long-term nutrient dynamics in eutrophied lakes. For example, the lake has still not reached a new steady state following the cessation of nitrogen inputs in 1990, and debate exists about the relative importance of these long-term changes for assessing recovery. Continued eutrophication of Lake 227 will provide an important platform for future studies of eutrophication remediation and recovery. For example, Lake 227 provides an ideal location for assessing why lakes vary in their potential to recycle nutrients from sediments. An understanding of these factors is essential for predicting the recovery of lakes from eutrophication. The enormous amount of data available from Lake 227 makes it an excellent location for testing new technology for assessing eutrophication and for examining the effectiveness of proposed remediation techniques. Future scenarios predict a warmer climate with varied rainfall for many areas in Canada. Inland lakes and their watersheds will be affected by reductions in the amount of water available, as well as through reductions in the delivery of essential nutrients that may limit production of recreational and commercial fish species. Drier conditions will affect downstream development and production of hydroelectric power. Direct manipulations of water inputs to lakes also occur as a part of many industrial developments, such as mining. A direct manipulation of water flow to a lake is being conducted to assess impacts to Lake 626 at ELA. After three years of background study, water inputs to the lake were reduced by 80% by redirecting upstream water inflows. Preliminary data indicate initial modest increases in water clarity and increased heat penetration into the lake. Continuation of this study is necessary to determine ecosystem impacts, including habitat alterations and population changes to lake trout, a cold-water top predatory fish. This study will demonstrate how climate-induced change may affect Canadian lakes, and produce predictive models for the kinds of adaptation that will face the organisms in the lakes and the people using them. Researchers from the University of Waterloo and the United States Geological Survey are examining impacts to wetlands downstream of Lake 626 and the diversion channel. Although nanotechnology promises to greatly improve our lives, the health and environmental hazards are not fully understood. Nanosilver is currently the most widely used engineered nanomaterial and is used in hundreds of products as a bactericide. Silver nanoparticles are found in socks, baby bottles, cutting boards and washing machines. Although silver nanoparticles enter the aquatic environment through wastewater discharges, its fate and impacts on whole-lake ecosystems and food webs are not yet known. Researchers from Trent University (Project lead: Dr. Chris Metcalfe) are currently adding nanosilver to a small lake at ELA in very small amounts to better understand its ecosystem impacts. This is urgently needed because there are no specific policies for managing nanomaterials in the environment. Environment Canada supports the continuation of this research for the 2014 field season. One aspect of research at ELA involves monitoring lakes where experiments have taken place to ensure they recover from the experimental treatments. Parameters to be measured vary, depending on the manipulations occurring in the study lakes and their anticipated impacts. A suite of unimpacted reference lakes will also be monitored to establish baseline conditions. Monitoring of these lakes will consist of data collection required to maintain the historical data set. These include monitoring of meteorology, hydrology, water chemistry, and major components of the food web. A 2013 review of data collected from lakes at ELA indicated that most have fully recovered from past manipulations. Several, however, have not yet returned to background conditions, and ongoing monitoring is providing crucial information on recovery. One of these is Lake 658, which is recovering from a whole-ecosystem mercury addition between 2000 and 2007. Fish from remote lakes around the world have become contaminated with methyl mercury, a neurotoxin and endocrine disruptor. For example, more than 80% of the lakes listed in the Guide to Eating Ontario Sport Fish currently have mercury consumption advisories. This elevated mercury comes primarily from precipitation and the burning of coal. The United States Environmental Protection Agency and Environment Canada have proposed regulations that would require power companies to reduce mercury emissions, with a potential cost of billions of dollars. An important question for policy and management is: will these costly reductions in mercury loading to the atmosphere reduce methyl mercury concentrations in fish and other biota? To test this question, from 2000 to 2007, researchers from Canada and the U.S. added uniquely identifiable mercury (as stable isotopes) to Lake 658 and its watershed at ELA using boats and a small aeroplane. These additions simulated levels of mercury deposition previously seen in the eastern United States and Scandinavia. Since 2007, no mercury has been added to Lake 658 and researchers are following recovery. The experiment has demonstrated clear linkages between mercury in fish and changes in atmospheric mercury deposition, providing support for proposed legislation. Information on recovery is required to estimate how long it will take for reductions in mercury emissions to the atmosphere to affect mercury concentrations in fish. This information is crucial for understanding the potential effectiveness of proposed legislation and for managing expectations by the public and industry. Another lake in recovery is Lake 375, which was the site of a whole-ecosystem aquaculture project between 2003 and 2007. Most parameters have returned to background conditions in Lake 375, but monitoring of the lake trout population continues. Because lake trout have long lives, their response is much slower than other components of the ecosystem. We will be providing updates throughout the process and we welcome feedback from everyone. The intent of this pilot is to build it into a full summer program whereby students from Manitoba and Northwestern Ontario can gain their Grade 12 Biology and Global Issues credits. We still have couple of spaces available for any students in high school who might be interested.